Online exhibition catalogue with detailed artists’ biographies. Oil on panel, signed lower left, signed, titled & inscribed verso. Probably painted 1905/6. This month's painting features the Royal Palace of Fontainebleau which, along with Versailles is one of the largest of the French Royal chateaux, and lies some 35 miles SE of Paris, on the site of a 12th century mediaeval royal chateau. It served as a residence for monarchs and emperors from Louis VII to Napoleon III. Today it is a national museum and, since 1981, a UNESCO World Heritage Site. The formal gardens have been a feature of the Palace since the reign of Francois I. Henri IV & Catherine de’ Medici (and probably his Chief Mistress, Diane de Poitiers,) made extensive improvements, adding a large boating and fishing lake, stocked with carp. On the other side of the Palace, he ordered the building of a Grand Canal, stretching 1.2kms along the axis of a Parterre. Between 1660 and 1664, under Louis XIV, Andre le Notre (1613-1700), the landscape architect of the Palace of Versailles and principal royal gardener, assisted by Louis Le Vau, rebuilt the Parterre on a grander scale and, between 1661-62 they created the Bassin des Cascades, decorated with fountains, at the head of the Canal. The Cascades were allowed to deteriorate until, in the early 19th century, under Napoleon Bonaparte, repairs and renovations were carried out and Louis’ fountains were removed, probably because it was too difficult to get them to work again. Napoleon III took a great interest in the Bassin and in 1864, the Cascades were re-decorated with classical sculptures and reliefs, in marble and bronze on plinths and in niches and in 1866, a large bronze Eagle, symbol of Imperial France, was commissioned from the animalier sculptor, Auguste Cain (1821-94) and installed as a centrepiece. The Bassin represents one of the few surviving examples of a French architectural and sculptural ensemble covering several centuries, serving as a re-affirmation of imperial power. It was painted by Alexander Jamieson, who was born in Glasgow on 23 September 1873 and trained at the Haldane Academy (Glasgow School of Art) in the mid- 1890s. In 1898, he won a scholarship to study for a further year in Paris where, in the progressive atmosphere of contemporary French painting, his style began to develop a broad Impressionistic character. 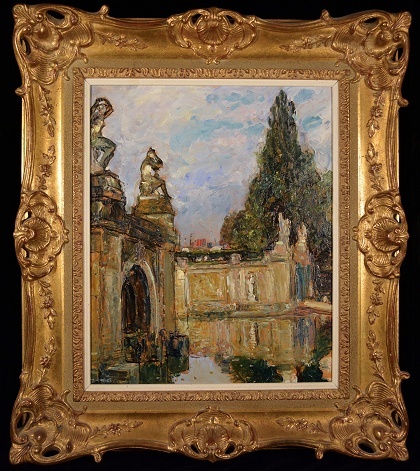 He met many of the Impressionist painters and was introduced to their techniques of painting in oils "au premier coup" and "wet-in-wet", where the next layer is applied before the first has dried and he used this to good effect; many of his paintings achieved a characteristic glossiness. Jamieson was much taken with France and Paris in particular. While in Paris he met the painter Gertrude (Biddy) Macdonald, two years his senior; she was born and studied in England, but had moved to Paris to continue her studies. They married in 1907 and settled in a studio in the Cromwell Road, South Kensington. By the early 1900s Jamieson was already showing at the NEAC, the International Society and selling at the Goupil Gallery. He made a series of studies of Versailles and Fontainebleau around 1905/6, when this study of the Bassin des Cascades was probably painted. His early work showed a close affinity with the Glasgow School, but, as Lavery pointed out, his later work was in the English tradition of landscape painting. He visited Spain in 1911, and held his first, successful, one man show at the Carfax Gallery, in London in 1912. 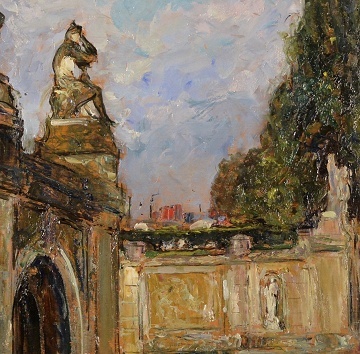 He worked mostly in oil and painted landscapes, town scenes and occasional portraits, retaining from his days in Paris a particular fondness for the towns and countryside of the Continent. He enlisted in Kitchener's "New Army" as a volunteer in 1914 and in 1915 was commisioned into the 10th Bn York & Lancs Regiment. He served throughout the Great War, taking part in the bloody battles of Loos, the Somme and Arras from 1915-18. He transferred to the Royal Flying Corps in January 1918 and was demobilised in 1919, at the age of 45. The National Army Museum has a painting by 2/Lt Jamieson of Field Marshal Lord Kitchener inspecting the 10th Battalion at their tented training camp in Halton, Buckinghamshire, in 1915. After the war, he settled with Biddy in the village of Weston Turville in the Vale of Aylesbury, a mere couple of miles from his old camp in Halton. He continued to paint and exhibit while living there, enjoying considerable acclaim for much of his work. But the Great War had taken its toll of him and he died aged 63, in London on 2 May 1937 and is buried in the churchyard of St Mary the Virgin, Weston Turville. Biddy Jamieson survived him, dying aged 80 in 1952 and is buried in the same grave. He was elected IS 1904 and ROI 1927. Oil on panel, signed lower left, signed, titled & inscribed verso.